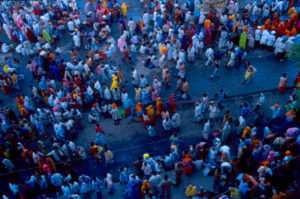 The Kumbha Festivals are the largest gathering of humanity on Earth. They speak of an ancient living tradition, of time-honoured rituals, of a cultural heritage that lives and breathes through centuries of time. Some historians trace its origin to the 13th century, others to the 7th century. The Kumbha is an amazing and spectacular spiritual congregation. It is replete with ritual and fanfare, discourses and prayers, yagnas, bhajans and kirtans conducted by sages from every tradition. Most people who visit the Kumbha are gripped in a trance state. They are deeply aware, at whatever level of recognition, of the spiritual significance of the Festival. The sincere seeker comes with devotion. For him, his presence here is itself the fruit of his devotion – he is blessed indeed. Others are mesmerised by the sheer enormity of the event. The teeming crowds and the many ages, cultures and times that are juxtaposed here are an eye-opener. Some come for a glimpse of exotica. But without exception, most are unprepared for the Kumbha. People have no idea where to go, or how to go about it. Therefore, they often simply follow the crowds, or their intuition. Staying arrangements and all facilities are stretched to the limits. So is the civil administration that copes with the situation. Though they have planned for months ahead they sigh with relief at the end of each Kumbha.